Are you thinking of marketing your medical device in Europe? If so, you must write and maintain a clinical evaluation report (CER) as part of your Technical File submission. 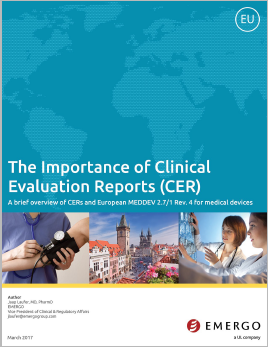 The EU Directives emphasize the importance of the CER and include specific requirements for clinical evaluation review and documentation. They also require you to maintain your CER even after you receive your CE Marking certificate. What are the steps in the clinical evaluation process? What are the steps for writing a good CER? What are common problems to avoid when writing your CER? How to update and maintain your CER post-CE marking? Download this 4-page white paper for answers to all these questions and more. Jaap Laufer M.D., PharmD is the Medical Director at Emergo by UL. Dr. Laufer has over 30 years of experience in the medical device and pharmaceutical industries. He previously held executive and senior regulatory positions at Pfizer, Abbott Laboratories, LipoMatrix, and other companies. His areas of expertise include a vast array of mostly implant, combination. and high-risk products; ISO and FDA QSR audits; and clinical study approvals, compliance and implementation. He holds a PharmD in Pharmacy from the University of Groningen and is an MD from the Medical School of the University of Nijmegen, both in The Netherlands. Dr. Laufer is a member of the Medical Devices Expert Group to the EU Commission and teaches at the University of Southern California.